Fr. John Reeves leads an OCMC Mission Team in prayer at St. Michael the Archangel Orthodox Church in Marshall, Alaska. He hopes to do the same in 2012. Men’s Fellowship meets every third Saturday for breakfast to gather for food, friendship and Christian “guy talk”. We talk about issues which affect us as husbands, fathers, and men in general. In short, we talk about how we can put our faith into practice. Now we have an opportunity to take brotherhoood a step further. 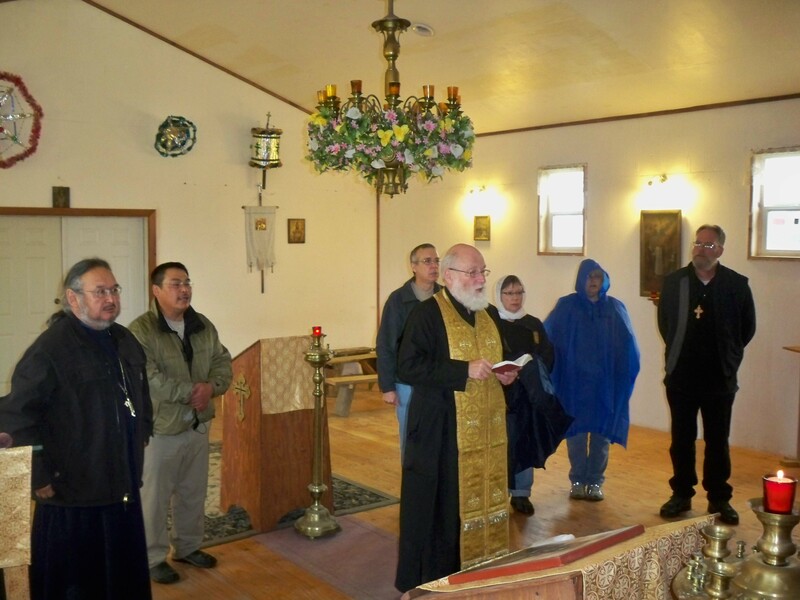 The Orthodox Christian Mission Center has presented us with an opportunity to lead a team to Marshall, Alaska to finish construction of the church there. (Marshall is the Yukon village where Fr. John spent part of his sabbatical in 2010, originally missionized by St. Yakov Netsvetov in the 1840s.) Our responsibility will be to man at least half of the 12-man team and provide the clergy leadership. The total cost of the July 21 to August 4 trip is $1,020 per person (not including airfare); participants will have the option to attend the 2012 St. Herman’s Pilgrimage on Spruce Island August 6-9. Orthodox men, aged 18 and upward, in good health with some carpentry skills are eligible. A final decision is due by Saturday, December 17 at our final breakfast for the year. Please speak to Fr. John or Dn. Alex for more information, or to sign-up.